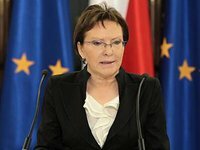 The Prime Minister of Poland Ewa Kopacz has said that the Ukrainian conflict has triggered an unprecedented security crisis in Europe. ''We have the greatest security crisis in Europe since the Cold War,'' she said in an interview with Polish media, adding that it would be irresponsible to disregard this threat. ''We need to protect our own interests, but at the same time fight for something that Ukraine is fighting for today," she said, adding that Europe should condemn those who don't respect Ukraine's desire for European integration. On March 11, Warsaw will host the annual conference of Poland's military leadership. The main topics will include the conflict in Ukraine and preparations for the 2016 NATO summit in Warsaw. Last night, Polish National Defense Minister Tomasz Siemoniak said that the conference will undoubtedly will be guided by the events in eastern Ukraine.